A: Upon finishing my undergraduate degree in Agronomy Plant Science, I knew that I wanted to pursue even higher education. Looking at the options of a masters, PhD, or the DPM program I knew that the DPM program was the one for me. It is a unique multidisciplinary option to further broaden my knowledge on topics that affect how plants grow. I knew that the DPM program would make me very marketable for a diverse career in agriculture. Q: What is your current occupation, and how has your DPM degree aided you in the tasks and responsibilities associated with your position? 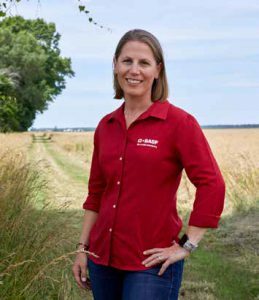 A: I am currently an Innovation Specialist working for BASF in Northeastern NC and Southeastern VA. As an Innovation Specialist, I get to work closely with farmers across my territory in a consultative sales role. The main crops I work in are corn, soybeans, cotton, peanuts, and wheat, and to a lesser extent sweet potatoes, white potatoes, tobacco, and cucurbits. The DPM degree prepared me to be an agronomic advisor for these farmers helping to solve problems (weeds, diseases, insect pests, nematodes, fertility issues ect.) and making the best recommendations for crop protection products on their farms. A: The DPM degree helped me to refine my time management, organization, problem solving and critical thinking skills, which has helped me in work life and in my personal life. The DPM program also kept me in Gainesville long enough for me to meet my husband John who is also a Gator grad. A: There are many day-to-day challenges that I face in my work life that I am more prepared to handle due to what I have learned in the DPM program. Aside from challenges in a work day there are many challenges that the general public puts on agriculture. The knowledge gained in the DPM program helped me become more of an ADVOCATE FOR AGRICULTURE which has helped me actively participate in many challenging conversations trying to correct misconceptions about farmers and agricultural practices. A: The best advice I have for current DPM students is to tailor your class and internship choices to what you are passionate about, but also challenge yourself and get out of your comfort zone. I would also advise current students to start planning for their career EARLY, at least a year before graduation. Many companies hire full time employees out of internship or training programs, and often times you have to be enrolled in them a year before your graduation. Also consider looking at careers in ag industry as companies like BASF are always looking for people with a DPM skillset.